Olive oil or castile soap is, in it's simplest form, nothing but saponified olive oil. It's been used for centuries to gently clean and moisturize skin. I love olive oil soap! It's simple (or should be), naturally moisturizing, and nourishing. Saponification means to convert a fat into soap by treating it with an alkali. The alkali used in soap making is sodium hydroxide or potassium hydroxide, more commonly known an lye. All soap is made with lye. The base (lye) is mixed with the acid (oil or fat) to form a neutral (soap). Simple as that....or not. ﻿Does "soap" dry your skin? ...Is that why you choose a "moisturizing beauty bar"? That's because THE NATURAL GLYCERINE HAS BEEN REMOVED FROM MOST SOAPS! ...And replaced with synthetic glycerin and/or moisturizers. Natural glycerine is a moisturizer - a humactant that actually attracts moisture to your skin. Commercial soap makers, who most often use tallow (animal fats) in their soaps remove and sell the glycerine that is produced during the saponification process. There are so many products on the market that claim to be natural and or organic that it'll make your head spin. My favourite - Savon de Marseille. This soap has no added chemicals or fragrances. It's been made the same way in the south of France since the 1600's and it does wonders for dry skin. Some people don't like the earthy olive smell, I like it, but Savon de Marseille is also available in grapevine, rose petal, orange blossom, verbena, and lavender. If you choose to buy this soap in a 1kg block, you obviously won't be able to handle that in your hands while showering, but these blocks are easily cut into whatever size blocks you want. 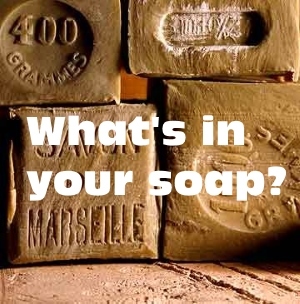 An average bath bar of soap is about 100 grams or 4 oz. That's 10 bars of soap! I like to buy the citrus soap, then I pour into a smaller bottle 2 parts soap, 1 part water, 1 part olive oil, and a few drops of vanilla. It's my creamsicle face and body wash and I love it! I just give the bottle a shake before I pour it on my face cloth or shower puff and it leaves my skin feeling soft and moisturized. I've also used the peppermint, lavender, and baby mild. The nice thing about the baby mild is that you can add what ever essential oil you like. There are less expensive brands, but the ones I've tried just aren't as rich. This stuff goes a long way with very little. I've been researching these products for several years now and can count on one hand the number of companies who offer true natural soaps, organic soaps, and other quality personal care products. There are a lot of soapmakers creating beautiful olive oil soap and other natural soaps that use essential oils and herbs to benefit the skin, but they can be pricey. Those soaps are worth the price, and I like to buy them as a special treat for myself or as gifts, but I really can't justify $5 - $10 for a bar of soap with a family of 5. (3 teenaged girls can use a lot of soap) I have found some good commercially made soaps for reasonable prices.